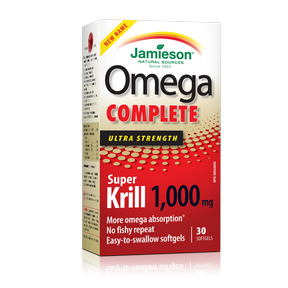 Omega COMPLETE™ Super Krill 1,000 mg is made of 100% pure Antarctic krill to help support heart health and reduce pain associated with osteoarthritis. These easy-to-swallow softgels are highly absorbable with no fishy repeat. Non-medicinal ingredients: Gelatin, glycerin, sorbitol, natural flavour (cherry vanilla). Adults and adolescents 9 years and older: Take 1 softgel daily.